Cheer is in the air as the holiday season approaches. Just don't overlook increased risks of being out on the road! As you head to Aunt Judy's Christmas dinner or Bob's Ugly Sweater Party, it is increasingly important to drive safely. 17,000 people die per year in the U.S. in motor vehicle accidents because they weren't wearing a seat belt. In December 2009 alone there were 2,387 fatal crashes. Pedestrian deaths account for 12 percent of all traffic fatalities. 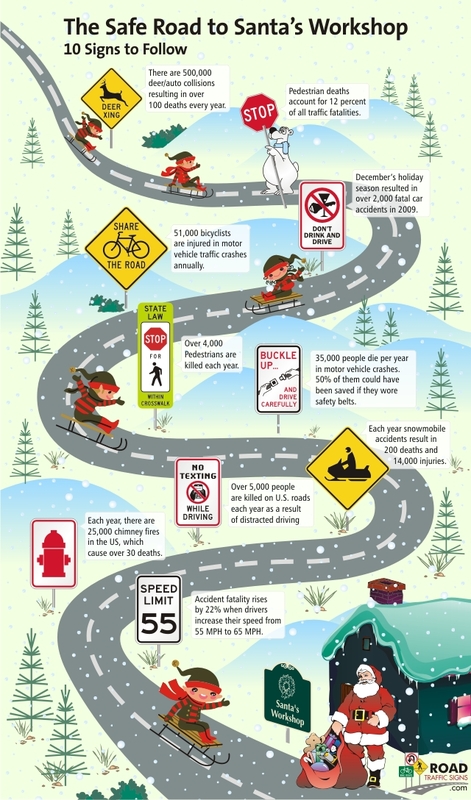 Sure, these facts are serious, but don't think of RoadTrafficSigns as the Christmas Grinch. Turn to these signs as a support system to help you drive safe this holiday season. Cheers, from RoadTrafficSigns.com.